The qualifying is complete and the draws are up for Monday's start at the ITF Grade 1 International Spring Championships here in Carson. There's no question which match I'll be covering. Brooke Austin and Mayo Hibi, two of the most accomplished and experienced, yet unseeded, players in the draw, are scheduled to meet on the Home Depot Center's stadium court, court 4, after two 16s matches. The Irvine-based Hibi, ranked 374 on the WTA's computers, is playing in her first junior event of the year. She reached the quarterfinals at the ISC last year, losing to eventual champion Allie Kiick. 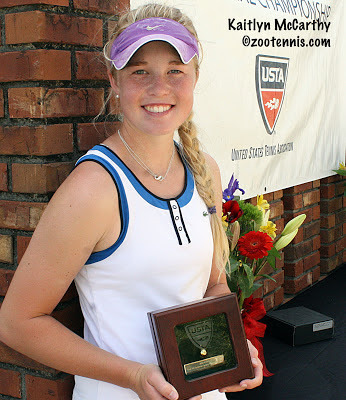 Austin, with a 541 WTA ranking, was a finalist two weeks ago at the USTA 18s Spring Nationals. Although it is not on Monday's schedule, there's another blockbuster first rounder in the boys draw, with No. 2 seed Stefan Kozlov drawn to face wild card Ernesto Escobedo, who has the best ATP ranking--967--in the field. Another match I'll be watching closely Monday will be Francis Tiafoe, the 16s finalist last year, against wild card Walker Duncan. The top seeds in the 16s are William Blumberg for the boys and Ally Miller-Krasilnikov for the girls. For Monday's order of play, today's qualifying results and the draws, see the tournament website. I'm on my way to California for the ITF Grade 1 International Spring Championships in Carson and the Easter Bowl in Rancho Mirage. It's my ninth year covering those two events, which go a long way in determining which US players will make the summer's junior slams. It will likely be past midnight Eastern time when I arrive at the hotel, and I'll be posting links to the ISC draw and the order of play then, but they may be available sooner at the tournament website, where they'll be posted as soon as qualifying is completed today. I will be following the qualifying at the WTA events in Monterrey and Charleston en route via the WTA/ATP mobile app (which I love) and also the final of the challenger in San Luis Potosi, where Daniel Kosakowski is in the final, so look for tweets @zootennis on those fronts. The top-ranked North Carolina women fell to No. 27 Virginia 4-3 today in Chapel Hill, the latest upset in a dual match season full of them. The Tar Heels played without their usual No. 4 or 5 Lauren McHale, while Virginia has been playing for sometime without their No. 4 Maci Epstein. The Cavaliers took the doubles point, then North Carolina tied it with Whitney Kay's win at No. 3. Caryssa Peretz at 6 and Julia Elbaba at 2 gave Virginia a 3-1 lead, but North Carolina tied it with wins by Gina Suarez-Malaguti at 1 and Caroline Price at 4. The match came down to No. 5 singles, and it was Virginia's senior Erin Vierra coming from behind to beat freshman Kate Vialle 3-6, 6-3, 6-1. Vialle had played only four matches in the dual season. It is Virginia's first win over a top-ranked opponent in program history. For the complete results, see the North Carolina website. Last night, No. 14 Stanford beat No. 4 UCLA 4-3 in women's Pac-12 action, but lost to No. 6 USC 6-1 today. Stanford's NCAA champion Nicole Gibbs lost to both Robin Anderson at UCLA and Sabrina Santamaria at USC at No. 1. USC had beaten No. 13 Cal 6-1 on Friday, while Cal defeated UCLA 4-3 today, without the services of their No. 1 Zsofia Susanyi. UCLA is without the No. 4, Chanelle Van Nguyen, who was injured in the Stanford loss. So it is USC that posts a 2-0 record in the weekend's round robin of NCAA contenders, with Cal and Stanford 1-1 and UCLA 0-2. 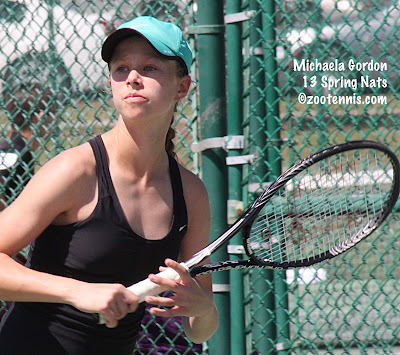 At the ITF Grade 4 in Claremont, 13-year-old Michaela Gordon, seeded No. 11, won the girls title, beating No. 8 seed Peggy Porter 6-4, 6-3. 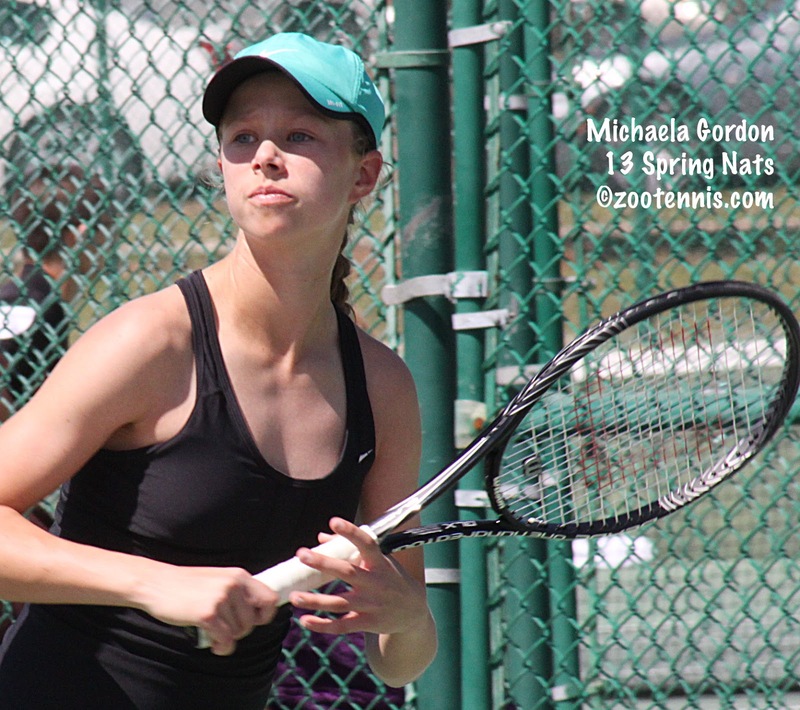 It was Gordon's 12th straight win in ITF junior competition, following her title at a Grade 4 in Mexico last month. Qualifier William Griffiths, playing in his first ITF tournament, won nine matches during the week to take the boys title, beating unseeded Gage Brymer 6-2, 3-6, 7-6(5), in what sounds like a terrific match. 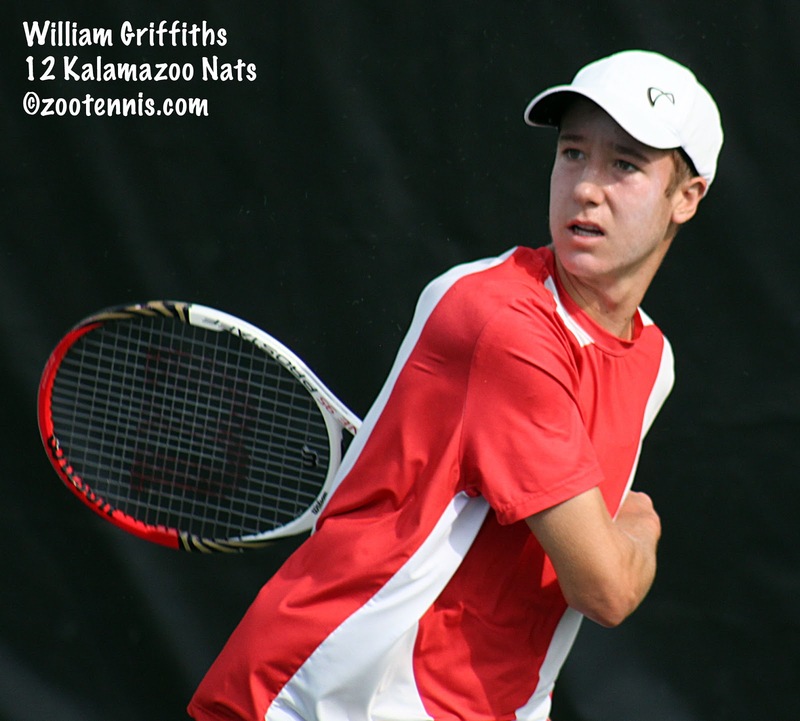 The 17-year-old Griffith had beaten top seed Henrik Wiersholm 7-5, 7-6(2) in Friday's semifinals. No. 3 seeds Basil Khuma of India and Anudeep Kodali won the boys doubles championship, defeating unseeded Justin Byrd and Stephen Watson 6-1, 6-0 in the final. Unseeded Erin Larner and Monica Robinson won the girls doubles title, beating No. 6 seeds Mayci Jones and Alyssa Smith 1-6, 7-6(5), 10-7. In Trinidad and Tobago, unseeded Helen Altick picked up the Grade 4 ITF title, defeating No. 8 seed Caroline Turner, also of the US, 6-3, 7-5. Americans Sofia Kenin and Jenna Freidl won the doubles title with a 6-3, 6-3 victory over Stephanie Nemtsova of the US and Jeung Won Yang of Korea. Both teams were unseeded. The boys singles title went to top seed Robbie Ridout of Great Britain, who defeated unseeded American Tillman Haynes 6-0, 6-2. Former UCLA Bruin Daniel Kosakowski hadn't won a match all year until this week at the $35,000 challenger in San Luis Potosi, Mexico, where he has reached the final. The 21-year-old Kosakowski, who was 0-7 in 2013 until this week, took out top seed John Millman of Australia in the second round, got a walkover into the semifinals, and today beat No. 4 seed Marco Chiudinelli of Switzerland 6-3, 6-4. Kosakowski will play unseeded qualifier Alessio Di Mauro of Italy, who defeated Tennys Sandgren 3-6, 6-4, 6-2. Draws are available at the ATP website. The qualifying is underway at the WTA Family Circle Cup in Charleston, South Carolina, and at the WTA in Monterrey, Mexico. Louisa Chirico and Mallory Burdette will face off for a place in the main draw in Charleston after both picked up wins today. Grace Min, Jessica Pegula and Vania King are the other Americans to reach the final round of qualifying. In Monterrey, it will take three victories to make the main draw, not the two necessary at both the Sony Open and Family Circle Cup. Americans through to the second round are Samantha Crawford, Alexandra Stevenson, Nicole Melichar and Allie Will. In Mobile, I had an opportunity to sit down with Paul Oosterbaan to talk about his commitment to the University of Georgia for the Tennis Recruiting Network. I also spoke with his father J.P., who played on the 1989 University of Michigan basketball NCAA championship team, and it was clear that winning a national title was a big factor in Paul's decision to attend Georgia. It's also interesting to hear that the 6-foot-8 17-year-old was inspired to concentrate on tennis rather than basketball, which he still plays recreationally, because he lived in Kalamazoo. He would spend all day every day at the tournament when he was younger, forming early the goal of playing there himself. That's food for thought with so many professional tournaments moving out of the United States, and with many of the signature junior tournaments being eliminated. Will there still be enough tournaments to inspire a young player to go all-in on the sport? 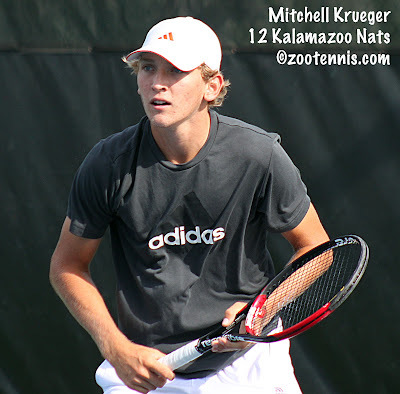 Mitchell Krueger is the subject of this question and answer session at tennis.com. Krueger explains his decision to forego college, his family background in the sport, choosing tennis over baseball and what advice he would give to young players. Krueger won the International Spring Championships in Carson last year, and speaking of that, Steve Pratt, the media aide for the upcoming Grade 1 ITF International Spring Championships and the ITF B1 Easter Bowl, has written this excellent preview of next week's tournament. Pratt has been covering the tournament for several years and is well-versed in the Southern California competitive tennis scene, and he will also be writing daily articles from the tournament next week for the USTA. The qualifying draws will be out later tonight, so please check the tournament's webpage for those. Qualifying begins Saturday, with the tournament main draw beginning on Monday. The ITA released the latest Division III rankings yesterday, and unlike Division I and Division II, there are two new teams at the top. Claremont-Mudd-Scripps has taken the No. 1 men's ranking from National Indoor champion Kenyon, which dropped to No. 2, and the Williams women moved to the No. 1 spot from No. 2 replacing National Indoor champion Johns Hopkins, which fell to No. 4. The ITA release, with links to the complete rankings, can be found here. Labels: College Tennis, International Tournaments, Junior Profiles U.S.
One of the highlights of any junior's career is a nomination for the annual Bill Talbert Sportsmanship Award, and thanks to the USTA's Pat Mitsch, I am able to pass along the names and information on the 2012 national winners: Hadley Berg (Northern California), Xavier Gonzalez(Texas), Spencer Liang(Mid-Atlantic) and Aaron Revzin(New England). The four players and their families are invited to the International Tennis Hall of Fame ceremony in July, where they will witness the induction of Martina Hingis, among others, and will receive their awards. - 2010 Boys' and Girls' 16 Zone Team Championships (Level 2) Spirit Award - a member of the NorCal team that won the award for sportsmanship and team spirit. • 2011 Girls’ 18 Solano Junior Excellence (Level 4) – winner of daily award for outstanding sportsmanship; award is given to a boy and a girl each day. • 2010 Girls’ 16 NorCal Sectional Championships (Level 3) – winner of daily award for outstanding sportsmanship; award is given to a boy and a girl each day. • 2007 Spare Time Memorial Day Junior 12s Excellence (Level 4) – winner of Tournament Sportsmanship Award; award is given for outstanding sportsmanship throughout whole tournament. Sportsmanship Award; award is given for outstanding sportsmanship throughout whole tournament. • USTA NorCal Sportsmanship Bag Tags – At least five (5) since program began. Hadley has a couple more bag tags but cannot remember from what tournaments and years they are from. Team Competition) NorCal Sportsmanship Award Winner – winner chosen by SoCal team. 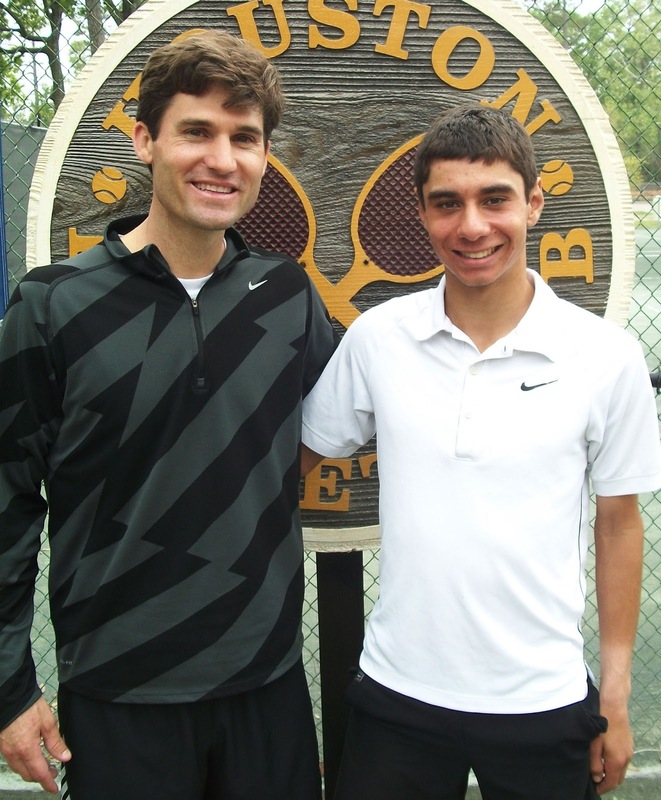 For more on Gonzalez and his award see this article from the Houston Tennis Examiner. Congratulations to these four and all the other juniors who were nominated by their sections for this prestigious award. The USTA announced today that two more CollegeMatch days have been added to the 2013 schedule, both of them men's matches: an April 6 match between BYU and Boise State, as part of the USA-Serbia Davis Cup tie, and USC at UCLA on April 19th. WHITE PLAINS, N.Y., March 28, 2013 – The USTA announced today that it will spotlight two additional college tennis matches this season as part of its College MatchDay series: BYU at Boise State men on Saturday, April 6, in Boise, Idaho, and USC at UCLA men on Friday, April 19, in Los Angeles. In Boise, College MatchDay will be held in conjunction with the U.S. Davis Cup Team’s World Group Quarterfinal tie vs. Serbia April 5-7 at Boise State’s Taco Bell Arena. The Boise State vs. BYU men’s match will be held at the Boas Tennis Center on campus that Saturday at 9:30 a.m. local time, three hours before the 12:30 p.m. start time of the Davis Cup doubles match scheduled for that day at Taco Bell Arena. “The dream of getting Davis Cup to Boise State was great. Now, to play BYU and have MatchDay in conjunction with Davis Cup made the dream that much better,” said Boise State coach Greg Patton. “It is going to be an unbelievable festival and celebration of college tennis, Davis Cup tennis and basically tennis in the team format." College MatchDay debuted in February with more than 1,000 fans attending the Florida vs. Stanford women’s match in Gainesville, Fla., and continued with the Virginia men hosting Duke in March. The USTA launched College MatchDay this year to highlight a number of premier men’s and women’s college tennis team matches each season, organizing activities and local outreach surrounding the host team’s campus. College MatchDay will feature a team match every week beginning in 2014. The USTA has partnered with college tennis by serving as the title sponsor of the USTA/ITA National Intercollegiate Indoor Championships, held at the USTA Billie Jean King National Tennis Center’s indoor tennis center, the USTA/ITA National Small College Championships, the USTA/ITA National Collegiate Wheelchair Championships and more than 85 USTA/ITA Regional Tournaments. The USTA also names and funds its annual Collegiate Team, a high-level training program for top American collegiate tennis players designed to provide them with exposure to the USTA Pro Circuit in a team-oriented environment. Wild card Chalena Scholl picked up her best win on the professional circuit yesterday at the $50,000 Pro Circuit tournament in Osprey, Fla. Scholl, who hasn't played a junior event since reaching the quarterfinals of the Orange Bowl in December, defeated Russian veteran Nina Bratchikova 6-4, 2-6, 6-1 in the first round of the tournament, which has an especially strong field. How strong? Bratchikova, ranked No. 108, wasn't seeded; a player needed to be inside the top 100 to be among the eight seeds. Scholl had a good run at the $25,000 tournament in Innisbrook, qualifying with three wins over players in the 200s. Her best win, prior to beating Bratchikova, was at last year's Charlottesville $50,000, where she defeated No. 210 Heidi El Tabakh of Canada in the second round of qualifying. 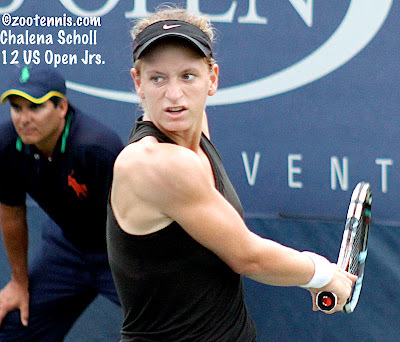 Scholl plays qualifier Mariana Duque-Marino of Colombia in Thursday's second round. Jennifer Brady, a wild card into qualifying, had three good wins to advance to the main draw, but she lost to No. 90 Jana Cepelova of Slovakia 6-2, 4-6, 6-2 in first round action today. Czech Katerina Siniakova, the Orange Bowl and Australian Open girls finalist, who received entry with a junior exemption, continued her outstanding play this spring, picking up a 6-4, 3-6, 6-1 first round win over No. 119 Alexandra Cadantu of Romania. Davis Cup captain Jim Courier announced his team for the April 5-7 tie against Serbia in Boise, Idaho, with John Isner, Sam Querrey and the Bryan brothers, the same group that defeated Brazil in February, representing the US. No. 1 Novak Djokovic has committed to play, but Serbia will be without its other top 10 player, Janko Tipsarevic, who opted not to make himself available. The hitting partners for the tie are Mitchell Krueger and Tennys Sandgren. Sandgren, the former Tennessee All-American and 2011 NCAA semifinalist, is playing at the Challenger in San Luis Potosi Mexico this week, which is excellent preparation for the altitude he will face while practicing with the team in Boise. Sandgren defeated No. 7 seed Andrej Martin of Slovakia in the first round today 6-3, 6-3. At the first ITF tournament of the year in the United States, the quarterfinals are set for the Claremont Grade 4. Top seed Henrik Wiersholm is through, but he is the only Top 4 seed in either the boys or girls draw to make it that far. In fact, except for No. 8 seed Peggy Porter, there are no other Top 8 seeds remaining in either draw. Girls top seed Gabby Andrews gave a walkover to Kimberly Yee, who plays Porter next. Unseeded Meredith Xepoleas meets No. 9 seed Alyssa Smith; Monica Robinson and Angela Kulikov, both unseeded, meet in the third quarterfinal, and 13-year-old Michaela Gordon faces Maia Magill, who had upset No. 2 seed Maria Shiskina in the first round Monday. Wiersholm will play No. 9 seed Jake Stefanik, one of only three seeds left in the boys draw. Qualifier William Griffith meets unseeded Ciro Riccardi in the other top half quarterfinal. In the bottom half, No. 14 seed Eduardo Nava eliminated No. 2 seed Gerardo Lopez Villasenor of Mexico today 7-6(1), 6-3 and will play unseeded Taylor Fritz, the reigning USTA 14s champion. Unseeded Stephen Watson and Gage Brymer will decide the fourth semifinalist. For complete draws and Thursday's order of play, see the tournament site at usta.com. The ITA released the second set of national rankings for Division II today, with both the Armstrong Atlantic men and women retaining their places at the top. Barry is second in both rankings this week. In the individual rankings, Armstrong Atlantic's Georgi Rumenov is No. 1 in both singles and doubles (with Dan Regan) for the men, while BYU Hawaii's Annie Hwang is No. 1 in singles and double (with Sherry Liu) for the women. The ITA's release, with links to the full rankings, is here. The ITA team rankings showed no changes at No. 1 this week, with the Virginia men and North Carolina women staying at the top. Virginia remains undefeated this year, while North Carolina's only loss was to No. 2 Florida. The men's rankings saw some shuffling of the Top 10, but the women's rankings are virtually unchanged from last year with Michigan and Miami changing positions at No. 9 and No. 10. The Texas College Tennis blog's ranking system has the same two teams at No. 1, but differs after that. All the men's Top 10 are the same, just in different order; the Cal women are the major variation between the two systems at the moment, with the Bears 13th in the ITA rankings. I prefer the TCT ranking system, as it seems to coincide better with my own sense of the teams' strengths, but I'm constantly revising my opinion based on the latest upsets, so that could change. Below is the ITA's list of Top 25 upsets from last week. The first individual rankings in two weeks produced no changes, with Virginia's Alex Domijan and Florida's Lauren Embree remaining at No. 1. Domijan's teammate Jarmere Jenkins is now No. 2, followed by Mikelis Libietis of Tennessee and Peter Kobelt of Ohio State. Sabrina Santamaria of USC is No. 2 in the women's singles rankings, with Robin Anderson of UCLA and Zsofi Susanyi of Cal at 3 and 4. Santamaria and Kaitlyn Christian continue to hold the top spot in the women's doubles rankings. Duke's Henrique Cunha and Raphael Hemmeler are No. 1 in the men's doubles rankings. All women's rankings are available here; the men's rankings can be found here. 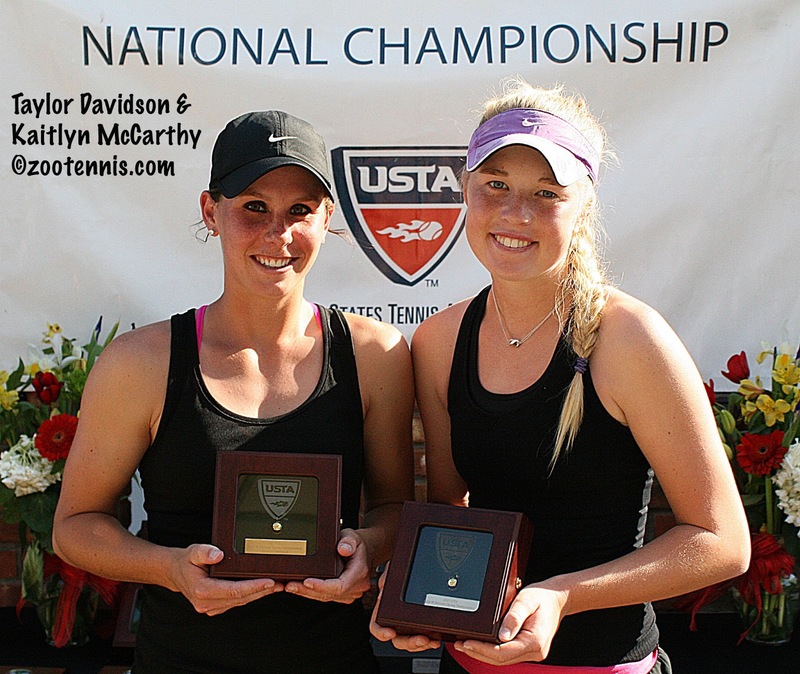 Embree was in the USTA's most recent college spotlight earlier this month. The senior from Marco Island, Fla. describes her typical day, and reveals what her plans are after graduation. There was a major upset in the first round of the ITF Grade 4 in Claremont, Calif., on Monday, with Maia Magill defeating No. 2 seed Maria Shishkina of Kazakhstan 7-6(5), 6-7(5), 6-0. Top seed Gabby Andrews also was tested in the first round, but she survived wild card Yuki Chiang 6-2, 6-7(2), 6-4. Half of the 16 girls seeds lost their first round matches. Half of the boys seeds also went out in their first matches, with No. 3 seed Arkadijs Slobodkins of Latvian the highest seed to lose. He fell to Teague Hamilton 2-6, 6-4, 6-4. Top seed Henrik Wiersholm, who has been out with an ankle injury recently, won his first round match, but defending champion Logan Smith, the No. 5 seed, fell to Spring National semifinalist Alexandru Gozun 6-4, 3-6, 6-2. Qualifier William Griffith took out No. 4 seed Hei Li of Hong Kong 6-3, 6-3 and reigning USTA 14s champion Taylor Fritz beat No. 6 seed Carter Lin 6-1, 6-7(5), 6-1. Complete draws can be found at the tournament site at usta.com. 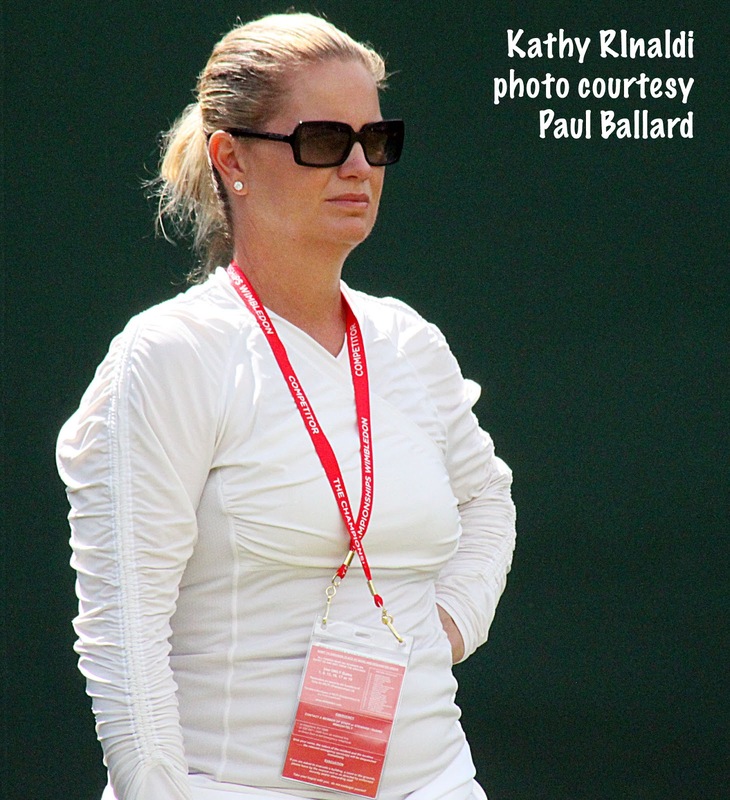 USTA National Coach Kathy Rinaldi was presented with the Tennis Education Merit Award at this month's USTA annual meeting in Florida, which prompted this article from columnist Ray McNulty at the Scripps Treasure Coast newspapers. I was surprised to read that Rinaldi has only been with the USTA for four years--she began in December of 2008--but I've seen her at so many tournaments, in so many places that it's hard to remember the days before she was employed by the USTA. Rinaldi is no longer working with Taylor Townsend, who now works with the USTA's Juan Todero according to Matt Cronin's reporting from Indian Wells, but Rinaldi continues to coach Samantha Crawford and has served as Junior Fed Cup coach the past several years. Rinaldi is quoted as saying “I absolutely love my job; it’s the best job in the world," and if you see her at a tournament, you can't help but see how much she enjoys it. But it's a difficult job too, one that requires a great deal of travel, away from her family, and the regular daily routine so many coaches prefer. With few women coaches at the USTA, or at the highest level of tennis anywhere, it's important to recognize those who are, those who can serve as role models and inspirations to others. Earlier this month the USTA announced the fourth annual US Open National Playoffs with US Open qualifying wild cards for men's and women's singles and a main draw wild card for mixed doubles again going to the National winners. The competition begins with qualifying in 13 sections, with all the events in May or June this year. The Southwest section kicks it off, on May 18th, and the Missouri Valley section concludes it, June 27-30. Any USTA member age 14 and older may participate, in any of the sections they wish to enter. The fee, which had been $125 in past years, is down to $100 now for singles, while the mixed doubles is $120 per team. The 13 sectional winners advance to the National finals at Yale at the end of August. Pop star Red Foo, the significant other of Victoria Azarenka, has entered, according to this release from the USTA. He will be playing in the Northern California section's tournament. For more information, go to usopen.org. The NCAA has announced that several of the regulations scheduled to be changed as of this summer are being reviewed, due to a sufficient number of override requests in one case, and its committee's own revision in two others. The regulation that was to allow unlimited text and telephone communication with recruits will be reviewed, an action necessary when the required 75 schools requested that it be reconsidered. The committee itself said it would review deregulating print materials and who could perform recruiting tasks. The prohibition of live scouting also proved unpopular and will be reviewed. For the NCAA announcement of these review and reconsiderations, click here. The ITF South American junior clay court swing ended today with the crowning of the Grade A Copa Gerdau champions in Brazil. Top seed Gianluigi Quinzi of Italy took the boys title 6-4, 6-3 over No. 14 seed Stefan Kozlov of the US, while the hometown fans left disappointed after No. 2 seed Varvara Flink of Russia defeated No. 5 seed Beatriz Haddad Maia of Brazil 1-6, 6-2, 6-1 for the girls championship. I watched as much of the two matches as my occasionally frozen stream would permit, but I'm not complaining, as any stream is better than none. Flink, 16, played poorly in the opening set, making a lot of unforced errors, while Maia was hitting her big left-handed forehand deep and with pace. Despite the one-sided score and all her errors, Flink had reason to hope, with all the games close. It appeared Flink's strategy was to move her 6-foot opponent around, especially forward, but Flink's drop shot attempts in the first set rarely made it over the net. In the second set, Flink played much better, reading Maia's serve and getting more returns in play. In the third set, Flink made almost no errors, handling the Maia forehand and serving extremely well. She was up 5-0 and had a match point before Maia finally held for 5-1, and served out the next game easily, with an ace ending it. Now 20th, Flink will move up in the ITF junior rankings with her first Grade A title. She has already won two Grade 1s this year. Quinzi won his first Grade A last year in Italy and has been No. 1 in the junior rankings. Now No. 3, this win will help him in his quest to get back there, although this summer's junior slams are likely to ultimately decide that position. Against the 15-year-old Kozlov, Quinzi started slowly, getting broken at 1-1 in the first set. Finding Kozlov's varied paces and style a bit confusing at first, Quinzi was the victim of several perfect Kozlov drop shots early in the match, but he began to anticipate and counteract them later in the set. Quinzi got the break back with Kozlov serving at 4-3, hitting a winner off a Kozlov drop shot on game point. After an easy hold, Quinzi got another break of the Kozlov serve with some nifty net play of his own. Kozlov's game, which relies less on power than on point construction and feel, is usually executed with very few unforced errors and a lot of defense, but in the second set, the errors were frequent and the defense less effective than usual. Quinzi, a 17-year-old left-hander, was able to find the lines when he needed to, yet could also stay in the long points. He had a 2-0 lead in the second set, lost his serve for 2-1, broke for a 3-1 lead, then never faced a break point the rest of the match. At the Grade 1 in the Philippines, No. 3 seed Cameron Norrie of New Zealand won the boys title, beating No. 4 seed Luke Bambridge of Great Britain 6-2, 6-4. The girls title went to top seed Ipek Soylu of Turkey, who defeated No. 13 seed Katie Boulter of Great Britain 6-2, 4-6, 6-3. It is the 16-year-old Soylu's second straight Grade 1 title; she also beat Boulter in the final last week in Malaysia. At the $15,000 Pro Circuit Futures in Costa Mesa, Calif., Bradley Klahn won his first Futures singles title, defeating Min-Hyoek Cho of Korea 6-3, 6-3 in the final. Until this month, Klahn, who had lost to Sanam Singh in the final of the Calabasas Futures last week, hadn't played a Futures tournament since 2010, spending his time either in Challengers and ATP events, or competing at Stanford. His ranking will improve from its current 226 when these points are added, but he told tournament press aide Joel Beers that isn't important to him. At the $25,000 Women's Pro Circuit event in Innisbrook, unseeded Julia Glushko of Israel defeated Patricia Mayr-Achleitner of Austria 2-6, 6-0, 6-4 in the final. Mayr-Achleitner had defeated 17-year-old qualifier Sachia Vickery 6-4, 6-4 in the semifinals. The doubles title went to No. 4 seeds Ashleigh Barty of Australia and Alize Lim of France, who beat unseeded Paula Goncalves of Brazil and Maria Irigoyen of Argentina 6-1, 6-3 in the final. There is no men's event this week on the US Pro Circuit. The women have a $50,000 tournament in Osprey, which is always one of the strongest fields of the year, given its proximity in time and geography to the Sony Open. 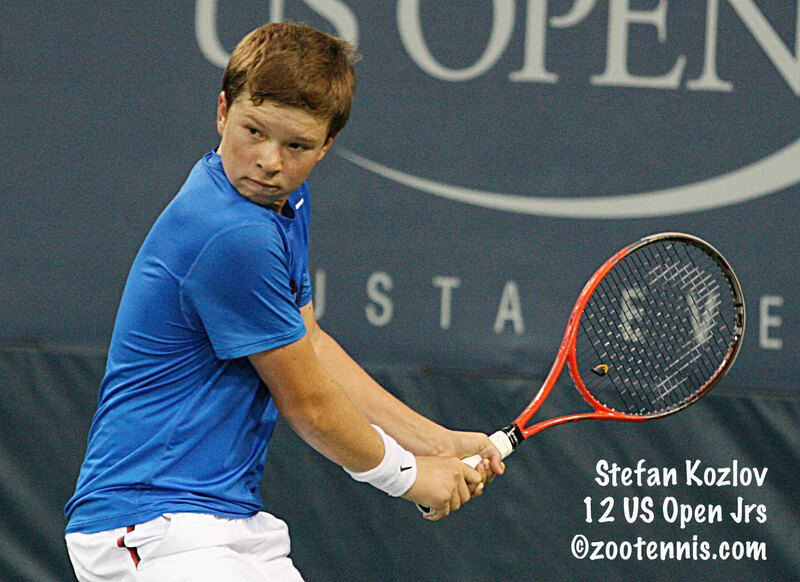 Stefan Kozlov, who turned 15 last month, has reached his first Grade A final at the Copa Gerdau in Brazil. Kozlov, who did not play from September's US Open Junior Championships until January's Futures in Florida due to an injury, managed to keep his ITF junior ranking in the Top 70 and some success in the recent South American clay swing has brought him to a career-high of 46. At the Copa Gerdau, Kozlov is seeded 14th, and he has yet to drop a set, taking out No. 4 seed Guillermo Nunez of Chile 6-3, 6-4 and Naoki Nakagawa of Japan 6-0, 6-3 on Friday, when both the third round and quarterfinals were played, due to rain on Wednesday. But his most satisfying win had to be in today's semifinal, when he defeated No. 6 seed Johan Tatlot of France 6-3, 6-2. Tatlot had won the title the two previous weeks at the Grade 1 Asuncion and Banana Bowls and had a 14-match winning streak on the Souther American clay. Tatlot had beaten Kozlov in the quarterfinals at the Asuncion Bowl, and this week had eliminated both Michael Mmoh and Luca Corinteli prior to today. Other than Kozlov's performance, not much good happened this week for Americans. Thai Kwiatkowski(3), Spencer Papa(7) and Mackenzie McDonald(8) all lost in the first round, although Javier Restrepo did qualify and win a round, and wild card JC Aragone won two matches, including a 4-6, 7-6(3), 6-3 victory over No. 2 seed and ITF world No. 12 Jorge Panta Herreros of Peru. Papa did reach the doubles final with Alexander Zverev of Germany. The No. 8 seeds, they lost to unseeded Orlando Luz and Marcelo Zormann de Silva of Brazil 3-6, 6-2, 10-5 in today's final. Only two US girls made it out of the second round, with top seed Christina Makarova losing in the third round, as did unseeded Banana Bowl champion Louisa Chirico. Chirico lost 6-4, 7-5 to No. 5 seed Beatriz Haddad-Maia of Brazil, who will play for the championship on Sunday against No. 2 seed Varvara Flink of Russia. The girls doubles final today went to top seeds Alejandra Cisneros and Victoria Rodriquez of Mexico, who defeated unseeded Haddad-Maia and Ingrid Gammara Martins 2-6, 6-3, 12-10. Kozlov's opponent in Sunday's final will be world No. 3 and top seed Gianluigi Quinzi of Italy. Quinzi, exactly two years older than Kozlov, had a tough match in today's semifinal, defeating No. 15 seed Quentin Halys of France 6-3, 6-7(4), 6-2. 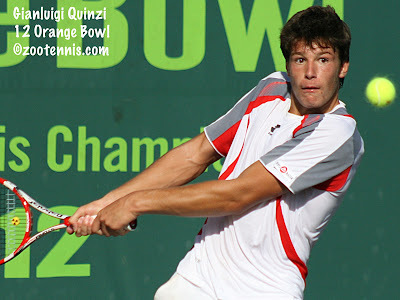 Quinzi beat Kozlov 6-4, 6-0 in their only prior meeting, in last year's first round at the Italian Open, which Quinzi went on to win. The tournament provides live streaming of stadium court, so both finals will be available, with the girls starting at 9:45 a.m. EDT (CORRECTED: 8:45 EDT) and the boys to follow. The ITF Junior website hasn't been posting the results regularly, but the draws can be found at the tournament website, which is also has the video streaming. The finals are set at the two Grade 1s taking place this week in the Philippines and Croatia. Great Britain's Luke Bambridge, the No. 4 seed will face No. 3 seed Cameron Norrie of New Zealand for the boys title, and top seed Ipek Soylu of Turkey will play No. 13 seed Katie Boulter of Great Britain for the girls title in the Philippines. There's a fine boys final in Croatia, with No. 1 seed Nikola Milojevic playing fellow Serb and Orange Bowl champion Laslo Djere, the No. 2 seed. The girls final is between Barbora Krejcikova of the Czech Republic, the top seed, and qualifier Victoria Kan of Russia. Kan, who played only two junior events last year and has a WTA ranking of 396, was ranked 17 in the ITF junior at the end of 2011. 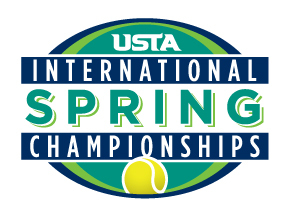 The first ITF spring tournament on the US junior circuit begins Monday in Claremont, California, with qualifying for the Grade 4 beginning today. There were two rounds of qualifying today, with another one on Sunday, with the main draw starting Monday. The draws and order of play can be found at the tournament website at usta.com. There's usually a sense of satisfaction when I've completed the written recap, produced the slideshow and uploaded the videos of a major junior tournament. Today that feeling is secondary to the sadness of knowing the 2013 edition of the Spring Nationals in Mobile is the last one. Scott and Lorraine Novak, who run the many tournaments and programs at the Mobile Tennis Center, were dedicated to making the tournament a great experience and were always finding ways to improve it, even though after three or four years, that didn't seem possible. I believe Mobile will receive a sanction for another gold ball tournament, probably the new team event now scheduled for the same time period, and I look forward to covering that. But I will miss this tournament, which I covered from its start in 2005, to its finish last Saturday. My recap for the Tennis Recruiting Network is here. The videos of champions Kaitlyn McCarthy and Elliott Orkin are embedded below. Videos of finalists Roy Lederman and Brooke Austin can be viewed by clicking on their names. A few days ago the USTA announced it would again distribute its French Open men's and women's wild cards by WTA and ATP points earned in upcoming Pro Circuit events. With those events on Har-Tru, the prevalent clay surface in the US, it makes sense for that company, based in Charlottesville, Va., to sponsor what is called the Wild Card Challenge, and they have signed a three-year deal to do so. The two best results from three April tournaments will decide who gets the reciprocal wild cards, with ATP or WTA points the method of keeping score. The men's tournaments are the Sarasota $100,000 Challenger April 15th, the Savannah $50,000 Challenger April 22nd and the $50,000 Tallahassee Challenger April 29th. The women's tournaments are all $50,000 tournaments: April 15th in Dothan, April 22nd in Charlottesville and April 29th in Indian Harbour Beach. 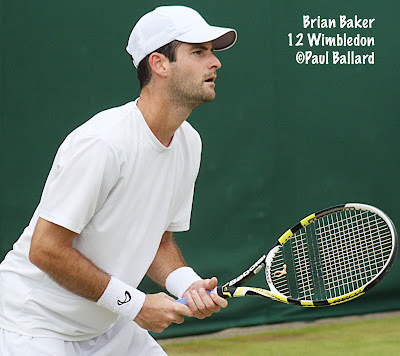 Brian Baker and Melanie Oudin won the French wild cards last year and it was the first time the USTA used that method to decide the recipients. I think it has been a popular change, with players not sacrificing possible ranking points for a separate tournament, which is how the Australian wild card is decided (although it is at a time of year--December--when there are few tournaments). The USTA also instituted the same method for distributing one of its US Open wild cards last summer, with Mallory Burdette and Steve Johnson earning those. Current college players will not be in the running for the French wild card, due to the time of year, but I'm sure many former ones will be competing. The complete announcement is here. The USTA junior competition revisions were passed by the sections during the annual meeting in Florida, and await approval from the board, which meets next month, before implementation can begin. For more on the changes and the timeline, see this article at usta.com. Prior to playing Madison Keys in the first round at the Sony Open last night, a match she lost 6-0, 6-0, Allie Kiick was featured in this article in the Miami Herald. Although her two qualifying wins may have given her second thoughts, Kiick reveals that she has verbally committed to the University of Florida for this fall. For more on wild card Vicky Duval's first round win on Wednesday, see this Miami Herald article by Sandra Harwitt. Top-ranked Virginia will host No. 8 Duke on Friday at 3 p.m. in the second of this year's USTA College MatchDays. Whether it is played indoors or outdoors has yet to be decided, but Ken Thomas of radiotennis.com will be on hand to provide live play-by-play of the ACC opener for both teams. 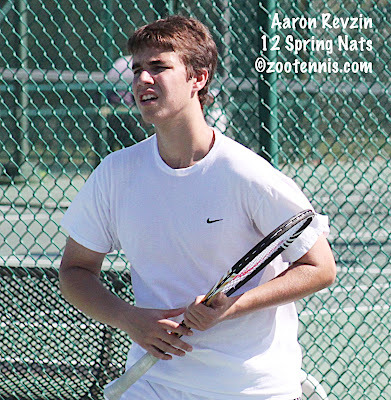 Acceptances for the ITF Grade 1 International Spring Championships in Carson, Calif. were posted some time ago, with the boys field containing just three ITF Top 30 players(at the date of acceptance) and the girls just two. Noah Rubin, who hasn't played since the Eddie Herr, is at the top of the acceptance list, with Spencer Papa and Mackenzie McDonald, who have since fallen out of the Top 30, the other two. Because the ISC is open to all players, there is an array of international competitors, with Japan's Naoki Nakagawa, Mexico's Lucas Gomez, Canada's Tommy Mylnikov and Germany's Alexandre Zverev among them. Christina Makarova is at the top of the girls acceptance list, and she is followed by three international players: Victoria Rodriquez of Mexico, Sandra Samir of Egypt and Alejandra Cisneros of Mexico. Jamie Loeb and Mayo Hibi, who have been having success on the Pro Circuit, will come into the juniors with added confidence. Belinda Bencic of Switzerland and Americans Katerina Stewart, Louisa Chirico and Sachia Vickery have withdrawn, as did Thai Kwiatkowski and Japan's Yoshihito Nishioka. More information on the tournament can be found at usta.com. The Easter Bowl acceptances have been posted, with Chirico, Stewart and Kwiatkowski among them, although Vickery has already withdrawn. Most of the same Americans competing in Carson will be in Rancho Mirage the following week. Please note that the ITF fact sheet has the wrong site listed for the Grade B1. It is no longer at Rancho Las Palmas, but this year is moving to the Sunrise Country Club in Rancho Mirage, which will serve as the main site for the event. 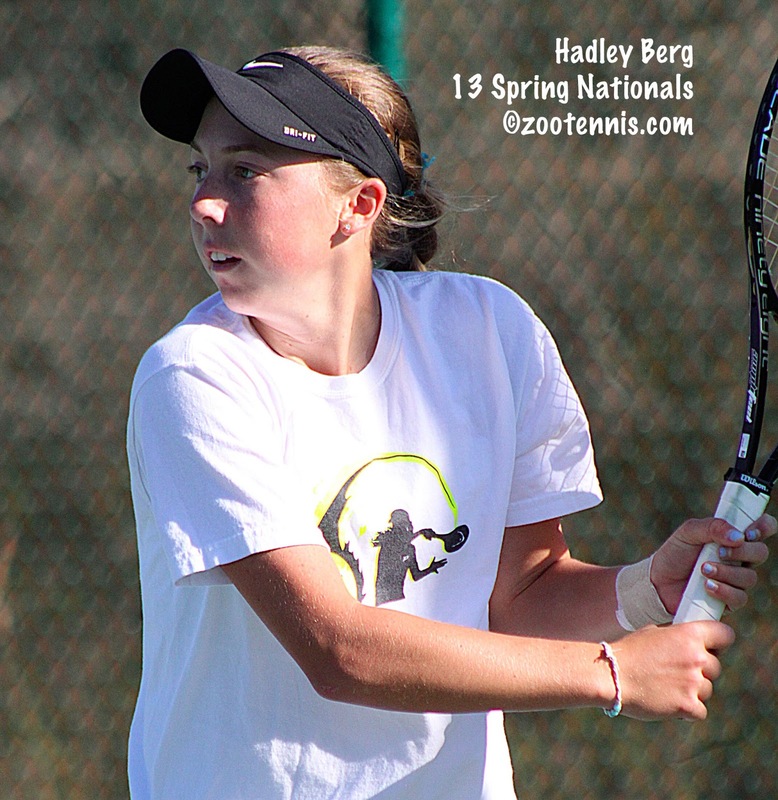 For the 14s and 16s Easter Bowl competitors, see the TennisLink site. Two big wins today for friends and longtime junior rivals Vicky Duval and Sachia Vickery. National 18s champion Duval, who won a round at the WTA Memphis tournament this year as a wild card, picked up her second WTA level win today, defeating No. 66 Andrea Hlavackova of the Czech Republic 7-6(4), 6-4 in the opening round of the Sony Open. Duval, who received a wild card into the main draw, didn't trail in the second set, although she did let 3-1 and 4-2 leads get away. After Hlavackova tied it at 4-4, Duval held and broke to win the match. She will play No. 22 seed and former world No. 1 Jelena Jankovic of Serbia. Mallory Burdette could have used a day off or a rain delay (which came today after she finished) to recover from her first qualifying match, which went past midnight on Monday and her second against Lauren Davis, which went over three hours, but she didn't get one, and lost to Slovakia's Magdalena Rybarikova 6-2, 6-4. Jamie Hampton won, as did wild card and 2012 Wimbledon girls champion Eugenie Bouchard. Allie Kiick and Madison Keys have yet to begin their match due to the rain delay. Vickery is playing in the $25,000 Pro Circuit event in Innisbrook, Fla., which has a exceptionally strong field due to its place on the calendar and its location. 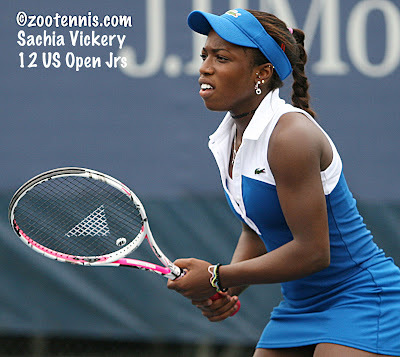 Both Taylor Townsend and Samantha Crawford failed to qualify, but Vickery did, and today she defeated No. 2 seed and WTA No. 141 Caroline Garcia of France 6-2, 6-4. Chalena Scholl also qualified and won her first round match over Katerina Kramperova of the Czech Republic, joining wild card Jamie Loeb and qualifier Jennifer Brady in the second round. Brady, who doesn't even have a WTA ranking, beat No. 5 seed and WTA No. 156 Kurumi Nara of Japan 7-5, 7-6(4). Sixteen-year-old Canadian Francoise Abanda, who hadn't played since the Eddie Herr, used an exemption as a member of the ITF Junior Top 10 to receive entry, but she lost to qualifier Beatriz Garcia-Vidagany of Spain 6-1, 6-1 in the first round. As I tweeted after No. 68 LSU's win over the No. 11 Texas A&M men last weekend, Division I college tennis is looking a lot like college basketball this year, with upsets the rule, not the exception. I doubt there will be a bigger surprise than the Stanford women's home loss to St. Mary's last month, but there have been some shockers recently that rival it. One reason for this is the unreliability of the rankings at this stage of the season, but that's been the case for many years now, and I don't recall this much chaos. The ITA now helpfully includes an Upset Central in their weekly releases, which includes any loss by a team in the Top 25. As you can see, there were several major ones, including unranked Boise State men beating Notre Dame and unranked San Diego women beating No. 6 Nebraska. Indiana's win over Duke was equally unexpected, although Duke was down to five players, with Monica Turewicz out for the season with an Achilles injury. Today Duke announced that Nicole Lipp, who played high school tennis, but was on the Duke soccer team, has been added to the roster. She is the older sister of Madeline Lipp, who has committed to Northwestern for this fall. Granger Huntress of the Texas College Tennis blog has just begun publishing his own rankings for this season, and there are some major differences to be contemplated. Most notable is Texas A&M women at No. 1 and ITA No. 13 Cal women much higher at 7. On the men's side, Pepperdine is at 5, not the ITA's 11, Kentucky is at 8, not 4, and Cal is at 14, not 24. It is also helpful that he's put the win/loss records out there, as the ITA doesn't do that. The complete ITA rankings can be found here. There were no individual rankings released this week. Last week, Lauren Embree of Florida and Alex Domijan of Virginia remained at the No. 1 spots. The Blue Gray National Tennis Classic was this weekend, with Boise State and Virginia claiming the titles in Montgomery. Boise State beat Texas Tech 4-3 in the men's final, and Virginia downed Tulane 4-1 in the women's final. And in one last college tennis note, in Mobile, I had the opportunity to speak with Harvard recruit Spencer Liang about how she navigated the recruiting process and about her Talbert sportsmanship award. This article, posted last Friday at the Tennis Recruiting Network, provides hope for those who do want to take their official visits and wait until they are seniors to make their decision. Tennis Recruiting has begun their countdown to their April 15 signing week coverage, and I will be providing a look at Kalamazoo blue chip Paul Oosterbaan's choice of Georgia at the end of this month. Qualifying was completed today at the Sony Open, with six Americans making the main draw: Rajeev Ram(8), Tim Smyczek(10) and wild card Robby Ginepri, who beat Jack Sock 6-4, 6-4, Bethanie Mattek-Sands, Allie Kiick and Mallory Burdette. Kiick, who has won two $10,000 Pro Circuit events, including one earlier this month, has never been beyond the quarterfinals at ITF Women's event above that level. But after her 6-4, 0-6, 6-3 win over Vania King, in which she won the last five games of the match, Kiick will be making her WTA debut Wednesday against fellow teen Madison Keys, who received a wild card into the main draw. Burdette didn't finish her first round qualifying match until after midnight Monday and her fitness will surely be tested in her match against Magdalena Rybarikova of Slovakia on Wednesday after she needed three hours and 15 minutes to beat Lauren Davis 6-7(0), 6-4, 6-4 this afternoon. Every game seemed to go to multiple deuces, and the only non-competitive game was the first set tiebreaker. Davis saved two match points at 3-5 in the third in a six-deuce game and one more in the next game, but Burdette managed to avoid a deuce in the final game, winning it on her fourth match point at 40-30. The Czech Republic's Katerina Siniakova, the ITF's No. 2 ranked junior, qualified with a 6-4, 6-3 win over Alex Glatch, and will play wild card Garbine Muguruza of Spain Wednesday. Until yesterday, Siniakova had never played above the ITF Women's Circuit $10,000 level. Wild card Monica Puig will face Mattek-Sands, wild card Eugenie Bouchard plays qualifier Shahar Peer of Israel and in an intriguing still-eligible-for-juniors battle, qualifiers Donna Vekic of Croatia and Yulia Putintseva of Kazakhstan will square off Wednesday evening. Not all of the men's qualifiers play Wednesday. Smyczek will play fellow qualifier Dmitry Tursunov of Russia, and Ram drew Belgium's Xavier Malisse, both on Wednesday's schedule. Ginepri faces Taiwan's Yen-Hsun Lu, probably on Thursday. The complete order of play for Wednesday can be found here. College tennis alumni supplied many of the finalists in the men's Futures events last week, with Texas A&M's Austin Krajicek, Virginia's Sanam Singh and Texas's Ed Corrie taking titles. Krajicek, 22, reached the final of the $15,000 Futures in Gatineau Canada two weeks ago, losing to former Auburn star Tim Puetz of Germany. Yesterday in Sherbrooke Canada, Krajicek, who was unseeded in both tournaments, beat former Wisconsin Badger Moritz Baumann of Germany, also unseeded, 6-4, 3-6, 6-2. 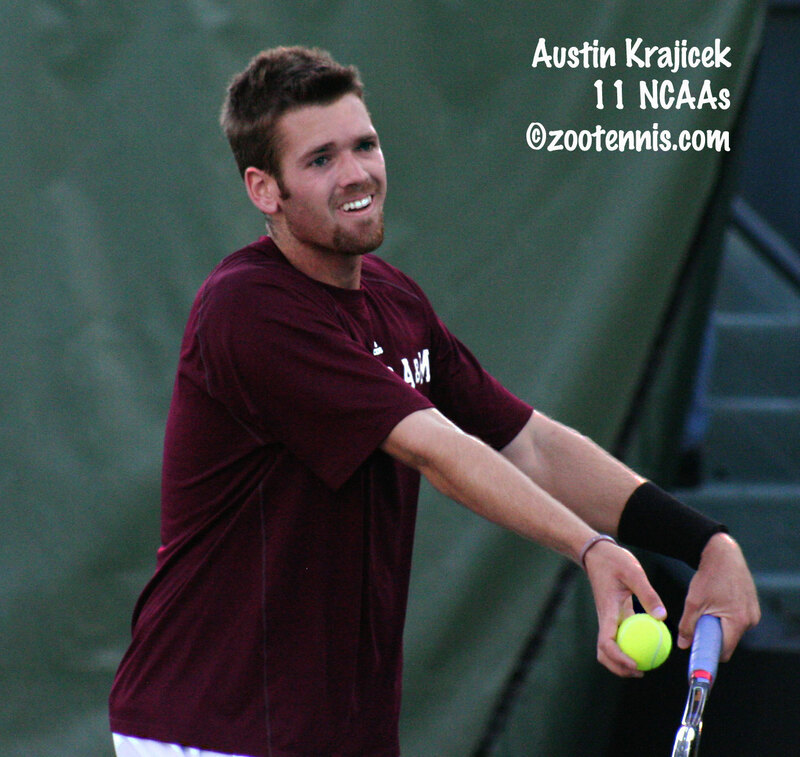 Krajicek, the 2011 NCAA doubles champion, also won the doubles title, with 2012 NCAA champion Chase Buchanan of Ohio State. The No. 2 seeds defeated top seeds Daniel Garza of Mexico and former Florida State star Vahid Mirzadeh 6-3, 6-2, and were never taken to a match tiebreaker in their other three wins. It was Krajicek's 11th doubles title (three of them Challenger titles, the rest in Futures) and third singles title, all in Futures. At the $15,000 Pro Circuit Futures in Calabasas, Singh defeated 2010 NCAA champion Bradley Klahn of Stanford 6-3, 1-6, 7-6(3) in singles and took the doubles title too, with former Alabama No. 1 Saketh Myneni. It is the 25-year-old Singh's seventh Futures title, but the first outside his home country of India. For more on the final, see this account from the tournament's Steve Pratt. Corrie continued his stellar 2013 with his third Futures title in his home country of Great Britain in the past two months. Seeded fifth in the Bath $10,000 Futures, Corrie, 25, defeated No. 4 seed Dan Evans, also of Great Britain, 6-3, 7-6(4) in the final. In the women's Pro Circuit $10,000 event in Orlando last week, no Americans made it past the quarterfinals. Jamie Loeb, who qualified, fell to No. 3 seed Conny Perrin of Switzerland in the quarterfinals. Top seed Masa Zec-Peskiric of Slovenia won it, defeating unseeded Belgian qualifier Michaela Boev 0-6, 6-4, 6-1. Yesterday I mentioned Allie Kiick's victory in the $10,000 event in Gainesville, which was two weeks ago. Today the 17-year-old wild card from Plantation, Florida posted her first WTA Top 100 win, defeating No. 71 Lara Arruabarrena of Spain, the No. 10 seed, 6-4, 7-5 in the first round of the Sony Open qualifying. Kiick was up a set and on serve early in the second when rain delayed her match, but the interruption didn't hurt her. After getting a break for 4-2, Kiick kept it, and had two match points serving for it at 5-4. She lost that game, but broke Arruabarrena in the next and converted her third match point after going to deuce at 6-5. Kiick will play Vania King in the second round of qualifying. Other American women posting first round qualifying victories were CoCo Vandeweghe, Alexa Glatch and Bethanie Mattek-Sands. Due to the rain, matches are still going on as of 10 p.m.
On the men's side, wild cards Steve Johnson and Jack Sock won their matches, with Johnson beating No. 16 seed Matt Ebden of Australia 6-4, 7-6(5) and Sock coming back to take out No. 12 seed Sergiy Stakhovsky of Ukraine 4-6, 7-6(3), 6-2. Other American men advancing to the second round of qualifying are Tim Smyczek, Rajeev Ram and Robby Ginepri, who will play Sock next. The main draws were released today, with wild card Vicky Duval drawn against Andrea Hlavackova of the Czech Republic and wild cards Madison Keys, Eugenie Bouchard and Monica Puig get qualifiers. 2011 Orange Bowl champion and 2012 US Open girls finalist Anett Kontaveit of Estonia will play Christina McHale. On the men's side, wild card Christian Harrison plays Thomaz Bellucci of Brazil and wild card Rhyne Williams draws Santiago Giraldo of Colombia. Wild card James Blake will play Ryan Harrison. Complete draws are available here. I've missed a lot this past week while devoting my time and energy to the USTA 18s Spring National Championships, so I'll be catching up on it all in the next few days. 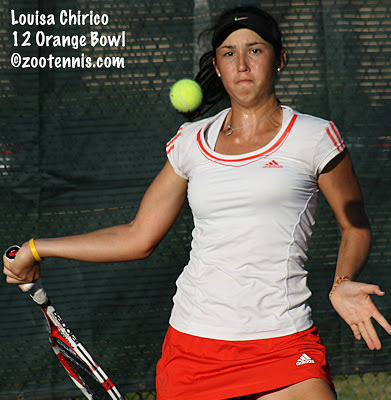 Louisa Chirico continued her breakout year by picking up her first ITF Grade 1 title at the Banana Bowl in Brazil. The 16-year-old New Yorker, who reached the final of the $25K in Surprise AZ last month as a qualifier, told me last year at the USTA 18s Clay Courts in Memphis that she really enjoys playing on the surface. Playing in her first tournament of the South American junior swing, Chirico was unseeded, but won all six of her matches in straight sets, defeating four seeds along the way. In the final, Chirico beat No. 15 seed Alice Matteucci of Italy 6-1, 6-1. Chirico was one of five US girls in the quarterfinals, along with qualifier Nicole Frenkel, top seed Christina Makarova, Tornado Black and Rianna Valdes. The boys title at the Banana Bowl went to Johan Sebastien Tatlot of France, who also won the Grade 1 Asuncion Bowl the previous week. The 16-year-old, seeded 12th, beat top seed Gianluigi Quinzi of Italy 6-3, 1-6, 6-2 in the final. 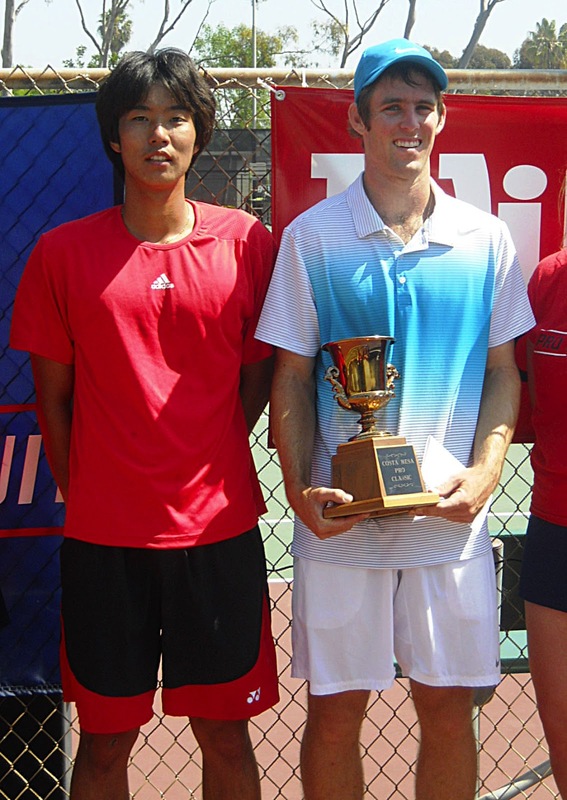 Thai Kwiatkowski was the sole American boy in the quarterfinals; he lost to Tatlot in two tiebreakers. The boys doubles champions were also the same as the Asuncion Bowl with Spencer Papa and Stefan Kozlov of the US claiming their second straight Grade 1. Kozlov and Papa, the No. 4 seeds, beat No. 3 seeds Quentin Halys of France and Pedro Cachin of Argentina 4-6, 6-3, 10-7. The girls doubles title went to No. 3 seeds Laura Ucros of Colombia and Constanza Vega of Argentina, who beat Ingrid Gamarra Martins and Beatriz Haddad Maia of Brazil 6-4, 3-6 10-7. At the Grade 1 in Malaysia, top seed Borna Coric of Croatia took the boys title and Ipek Soylu of Turkey won the girls title. No. 12 seed Katrine Steffensen of the US reached the quarterfinals. Dennis Uspensky, Martin Redlicki, Mackenzie McDonald(8), Thai Kwiatkowski(3), Farzin Danny Amiri, Dan Kerznerman, Spencer Papa(7), Stefan Kozlov(14), Justin Butsch, Michael Mmoh, Luca Corinteli(10) and JC Aragone. Quinizi is again the top seed this week. The US girls in the draw are: Christina Makarova(1), Rianna Valdes, Madison Bourguignon, Louisa Chirico, Elysse Graci, Tornado Black, Nicole Frenkel, Dasha Ivanova and Alexandria Stiteler. Only three Americans are in the entries for the two Grade 1s this week, with Katrine Steffensen and Usue Arconada in the Philippines, and Julian Zlobinsky in Croatia. Qualifying for the Sony Open begins on Monday, with several prominent junior girls receiving wild cards. After her win last week at the $10,000 Pro Circuit tournament in Gainesville, Allie Kiick will step up a level in Key Biscayne, where she received a qualifying wild card. Kiick will play No. 10 seed Lara Arruabarrena of Spain on Monday in the first round of qualifying. Other qualifying wild cards went to Bethanie Mattek-Sands, Jarmila Gajdosova, Orange Bowl and Australian Open girls finalist Katerina Siniakova of the Czech Republic, Belinda Bencic of Switzerland and Irina Khromacheva of Russia. Men's wild cards in qualifying went to 16-year-old Orange Bowl quarterfinalist Deiton Baughman, Ryan Sweeting, Yuki Bhambri of India, Robby Ginepri and Yoshihito Nishioka of Japan. Other young Americans in the qualifying draw include Jack Sock, Steve Johnson, Lauren Davis, Mallory Burdette and Maria Sanchez. It was also announced this evening the Rhyne Williams has received a main draw wild card, joining James Blake, Lleyton Hewitt, Guido Pella and Christian Harrison. Denis Kudla, who reached the final of this week's very strong Dallas challenger as a qualifier, losing to Jurgen Melzer of Austria 6-4, 2-6, 6-1 today, was unfortunately not granted a wild card. The order of play for Monday's Sony Open qualifying is here. The qualifying draws are available here. 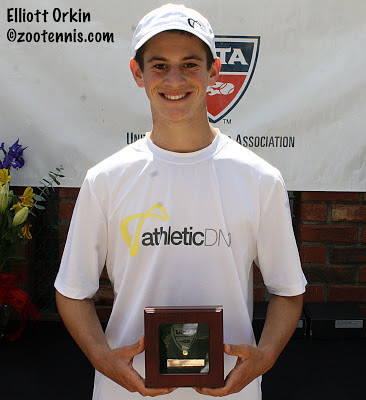 Elliott Orkin and Kaitlyn McCarthy took similar paths to the USTA 18s Spring National gold balls Saturday morning, both coming from a set down to oust experienced opponents on a mild and breezy day at the Mobile Tennis Center. Playing at the same time on adjacent courts, McCarthy defeated No. 1 seed and defending champion Brooke Austin 5-7, 7-5, 6-2, while Orkin outlasted No. 6 seed Roy Lederman 2-6, 6-3, 5-3 retired. Orkin, the No. 3 seed, knew exactly when the match turned in his favor. "Coming out in the first set, the wind was blowing and I was just making a lot of unforced errors, and he was as well. I don't think either of us played our best games," said Orkin, an 18-year-old from Marietta, Georgia. "In the second set, I saved break points in my first service games and broke him, and that's when the momentum really shifted and I started playing a lot better." Serving a 2-3 in the second set, Orkin was down 15-40, but saved both of those break points with big forehands. Lederman was unable to capitalize on two more break points in that game, and he knew, given his physical limitations, that he had let an important chance slip away. "I was up a set 3-2, 15-40 on his serve, and I just lost it mentally," said Lederman, who was playing with wrist pain that has been bothering him for months. "I didn't move my feet on the break points I had, I hit short, and he took advantage of the points and won four straight games. My wrist was hurting pretty bad, but I was going to tough it out--I was not going to stop from my wrist hurting--but then I started cramping in my legs, and I can't deal with the pain of cramping, it's the worst. It happens to me all the time and I couldn't move." Orkin took a 2-0 lead in the third set, but Lederman broke Orkin's streak of six consecutive games and got back on serve. When Orkin held for a 3-2 lead, Lederman called for a trainer and had his wrist taped, but he was not able to perform at his previous level. "I knew he wasn't 100 percent," Orkin said, aware that Lederman was having problems with his wrist even before the match started. "But when he called the injury timeout in the third set, I could tell he wasn't moving as well and he wasn't hitting the ball as well. That's almost harder than a normal match, and you have to focus even more than normal. The first time he served (after the medical timeout) he was just pushing his serve in and I lost the game, just because I wasn't focused and I thought it would be easier." Lederman admitted he couldn't move and had to "slap at every ball." "Somehow I was staying in points, hitting every ball as hard as I can," said Lederman, an 18-year-old from Miami who will be joining the Stanford Cardinal this fall. "It's disappointing, but it doesn't matter. I'm fine. It was a pretty good tournament. Not a good way to end it, but not too bad." Orkin saved a break point serving at 3-3, and after Lederman was broken in the next game, hitting his serves with no motion or pace, he retired, giving Orkin his first Level 1 title. "This is one of the biggest goals I've been working toward," said Orkin, who has signed to play at the University of Florida in the fall. "A gold ball is the biggest trophy you can win in junior tennis and I'd never even won a ball. My goal was to get a ball in this tournament, and to come out with a gold means the world. It feels like all my hard work paid off this tournament." McCarthy, the No. 15 seed, had gotten off to a miserable start against Austin, losing the first four games of the match. The 15-year-old from Cary, North Carolina got herself back in the first set by winning the next three games, and broke Austin serving for the set at 5-4, but she lost the next game and despite two double faults, Austin was able to close out the set 7-5. Austin was twice up a break in the second set, but was immediately broken back both times. At 4-4, McCarthy survived two double faults in a row and saved three break points, with Austin's return of serve letting her down. Serving at 5-6, Austin made four straight unforced errors and suddenly the match was all even. During the 10-minute break before the start of the third set, McCarthy called her coach Jake Lester, and spoke to her parents, who are traveling with her this week, which helped her relax. "When he's not traveling with me, I usually do end up calling him, because he usually finds ways to calm me down," said McCarthy. "He knows what to say--we've been together a really long time. I talked to my parents for a minute, because they help relax me as well. They know me better than anyone else." McCarthy was broken to open the third set, but as was the pattern throughout the match, Austin gave the break right back, hitting three double faults, including one on game point, to make it 1-1. McCarthy was down 0-40 in the next game, but won five points in a row, and Austin, who was alternating winners with errors, couldn't hold in the next game, making it 4-1 for McCarthy. Serving down 2-5 in the third, Austin quickly trailed 0-40, with McCarthy hitting a forehand winner in between an unforced error from Austin and a double fault. Austin saved one match point with a swinging volley winner, but, aggressive until the end, she bashed a forehand into the net after a long rally to end her winning streak in Mobile at 13. "She seemed to hit winners on every big point, especially in the second set" said Austin, a 17-year-old from Indianapolis, who was playing McCarthy for the first time. "In the third set I tried to play aggressive, but the balls just didn't go in. I just tried to keep playing my game; there wasn't much I could really do." Austin said McCarthy's serve was one of her strengths, an assessment McCarthy agreed with. "I served extremely well today," said McCarthy, who makes few errors regardless of the pace of her opponent. "It was definitely a better than average day. And it was execution on the big points. I made a couple more than she did today and that's sometimes how the ball rolls." McCarthy is looking ahead to the two big ITF tournaments in California next month, but first she plans to celebrate her singles and doubles gold balls in Mobile with some rest. "I'm really looking forward to sleeping a lot," said McCarthy, who is now healthy after a bout of whooping cough, which she contracted despite being vaccinated. "When I come back from these tournaments I always sleep a good solid 12 hours, because I don't get much sleep at the tournaments. You're so excited about playing your matches. Last night I was so excited and nervous--I was just a bundle of feelings." With her first two gold balls since the 12s division, McCarthy is looking ahead to more 18s competition with increased confidence. "Obviously, it's unbelievable for me right now. I'm still getting used to it actually," said McCarthy, who beat the No. 6, No. 4 and No. 2 seeds prior to taking out top seed Austin Saturday. "This just gives me confidence. I learned I can definitely hang in there and beat some of the top players in the world, and she played pretty well today, so that gives me some confidence for sure." In the matches for the bronze balls, No. 2 seed Rachel Pierson defeated No. 13 seed Chloe Ouellet-Pizer 6-3, 6-0 and Sasha Gozun downed No. 1 seed David Hsu 6-3, 6-3. Fifth place in the girls draw went to Allison Miller, a No. 17 seed, who avenged her main draw defeat to No. 6 seed Spencer Liang 6-2, 7-5. Collin Altamirano beat No. 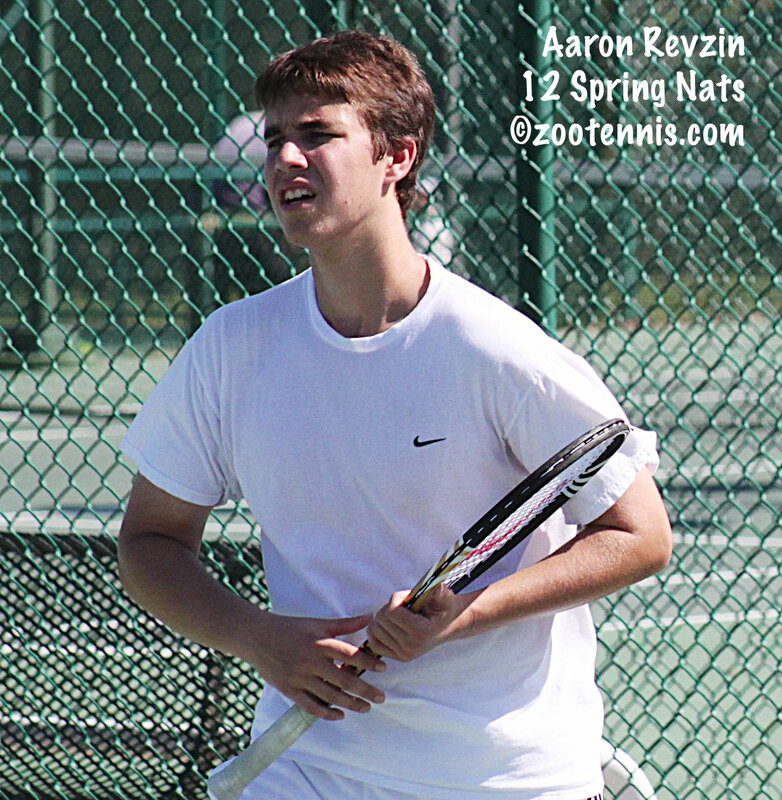 17 seed Aron Hiltzik 6-1, 6-4 to claim fifth place in the boys draw. Top seed Brooke Austin will be seeking her 14th consecutive victory in the USTA 18s Spring Nationals Saturday when she takes on No. 15 seed Kaitlyn McCarthy in the girls final. The boys championships will feature No. 3 seed Elliott Orkin, playing in his first USTA Level 1 final, against No. 6 seed Roy Lederman, after both posted impressive comebacks in Friday's semifinal action. Lederman trailed fellow Floridian wild card Sasha Gozun 5-1 in the final set before he reeled off six straight games to claim a 1-6, 6-4, 7-5 victory. Lederman, who is playing his first tournament since December's Orange Bowl, was experiencing pain in the wrist that had kept him out of action this winter, but he gave Gozun nothing in the later stages of the match. Gozun served for the match twice, at 5-2 and 5-4, but he failed to get to match point either time, as Lederman began to anticipate Gozun's serve patterns and counter his huge forehand effectively. Gozun's best opportunity to close out the match came at 5-2, when two big first serves gave him a 30-0 lead. But an unforced error on the backhand side and a double fault put Lederman back in the game, and two netted shots later it was 5-3. Lederman held at love in less than two minutes, and Gozun barely got a point in his next service game, and that one point came when he was already down 0-40. "I don't know if he was tight, but he was playing like a lunatic," said Lederman. "He just missed every shot. I guess he was nervous, maybe a little bit of me coming back and him getting nervous because he was so close to the finish, but it was like a miracle." Gozun gave no outward indication that he was frustrated or angry, but the errors kept coming. The 17-year-old from Sarasota had hope of stopping his downward spiral with Lederman serving at 5-5 in the third, down 15-30. But Lederman hit a good first serve that Gozun couldn't get back in play and then made two more errors to give Lederman his first lead in the third set at 6-5. Serving to force a tiebreaker, Gozun got to 30-30 when Lederman made a rare unforced error, slicing a backhand into the net. But Gozun shanked a forehand that landed yards out to give Lederman a match point, and when Gozun's short forehand caught the tape, Lederman had completed the improbable comeback. "I'm usually the one letting it go at the end," said Lederman, who turns 18 later this month. "I've been on the other side of the equation a bunch of times." Lederman credited his serve with turning around the third set. "I served well from 1-5, through the rest of the match," said Lederman, who said he was playing through the pain in his wrist, which had really begun to bother him for the first time this week. "I was going for my serve finally, that was a positive." In the other semifinal, played simultaneously two courts away, Orkin also lost the first set of his match with top seed David Hsu, but he didn't need a miraculous comeback in the third, instead posting a 2-6, 6-3, 6-2 victory. Orkin and Hsu are both aggressive baseliners who make a lot of balls, but in the first set both committed their share of unforced errors. Orkin finally began to find his rhythm midway through the second set, ending a streak of five consecutive breaks by holding serve for a 5-3 lead. Orkin broke Hsu for the fourth consecutive time to take the set, and after the 10-minute rest period, returned to take a 2-0 lead. Hsu, a 17-year-old from San Jose, California, broke back and held for 2-2, but Orkin began to step up his game as he saw Hsu tiring. "I knew going into the match it was going to be very tough," said Orkin, an 18-year-old from Marietta, Ga. "He just played a better first set than me. But I knew I have the game to come back and beat him. As the match was going on, I saw that he was getting a little fatigued, so the longer the point, the better for me." Orkin had never played in a Level 1 semifinal before, and because he turns 19 this fall and will be joining the Florida Gators then, he was determined to make the most of his opportunity this week. "I knew going into this tournament that I didn't have many more chances to get a ball, because I'm going to college in the fall," Orkin said. "So I'm just going to relish the moment and play my best tennis. Of course there's always pressure in this situation, but I feel like I play well in pressure, so I'm going to try to treat it like it's another match." Orkin, who is 5-foot-7, gives up six inches to Lederman, but Lederman, who defeated Orkin twice in National Opens last year, sees Orkin as a dangerous opponent. "He's playing really well, hitting the ball really well," said Lederman. "The last couple of times I played him I was dictating play, I was hitting big, unlike I did today, and I was controlling points against him--he was playing mostly defense. But what I see now, is that he's hitting the ball much harder and he's controlling points." Orkin is comfortable that the pace he gets on the ball compares favorably with that generated by his larger opponents. "For my size I feel I can get pretty good pop on the ball," said Orkin. "I've been playing players taller than me my whole life. This is nothing new to me. I'm used to playing people with those big serves and big forehands and I know how to play them." The drama was less pronounced in the girls semifinals, with Austin defeating No. 13 seed Chloe Ouellet-Pizer 6-3, 6-3 and McCarthy ousting No. 2 seed Rachel Pierson 6-2, 6-4. Austin started out blazing against the left-handed Ouellet-Pizer, taking a 3-0 lead to open the match, but the two breaks disappeared in a hurry as the 15-year-old Ouellet-Pizer won the next three games. Austin then went on a four-game run, and although Ouellet-Pizer again fought back to make it 3-3 in the second set, Austin was able to hold, break and hold to claim her 13th consecutive match in Mobile. "I think I tried to play too aggressive," said the 17-year-old Austin, who was playing Ouellet-Pizer for the first time. "I think with her you have to play patient, be aggressive and be patient, if that makes sense. Every time she'd lob, I tried to take it out of the air, so I basically made her not play her game. I tried to make her hit the ball--that was my goal--because I knew she didn't want to hit the ball." McCarthy was up 4-0 in the first set against Pierson, who wasn't showing the form she'd displayed all week. Although the temperatures were warmer and the wind was less of a frustration than earlier in the week, Pierson couldn't sustain many rallies. Down 3-0 in the second set, and reacting to another of her errors, Pierson said, "Holy smokes, could you be playing any worse right now?" Although that probably wasn't the reason, after that comment Pierson began to play much better, winning four of the next five games to make it 4-4. McCarthy held for 5-4, and Pierson had a couple of game points, but she didn't convert either, although she saved two match points with forehand winners in the game. After the fourth deuce, Pierson double faulted, and she couldn't save the ensuing match point, hitting a forehand long to end the match, which was nearly two hours long. "I'd never played her before, and I don't know exactly how she normally plays, but I can probably assume, since she made it this far in the tournament, that that wasn't her top level," said McCarthy. "But toward the end of the match she started playing better for sure." The 15-year-old from North Carolina is looking forward to playing Austin for the first time. "I do kind of know how she plays," said McCarthy. "I think it's going to be really fun to play someone as good as her. I'm going to enjoy myself and see what happens." McCarthy said she would be especially motivated to end Austin's streak at the Spring Nationals. "That gives me some extra incentive, I can say. Thirteen in a row, dang." McCarthy will leave Mobile a champion regardless of the result of Saturday morning's final, as she and Taylor Davidson, the No. 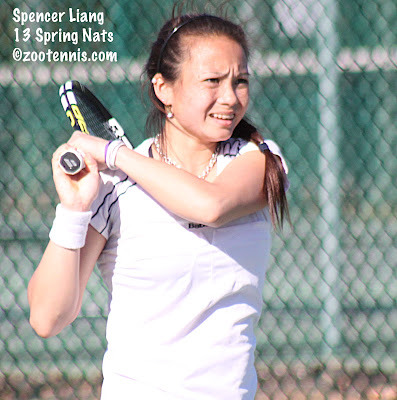 3 seeds, won the girls doubles title Friday afternoon, defeating Caroline Lampl and Sophie Chang, seeded No. 9, 6-1, 6-4. Despite more than two years difference in their ages, Davidson and McCarthy have teamed up often and successfully, although this was their first gold ball together. "All of my weaknesses are her strengths," said Davidson, who hadn't won a gold ball before today. "And her weaknesses are my strengths. I like my backhand and my speed helps the team. Her serve, her first serve percentage, helps so much and so does her consistency." "We just mesh well together," said McCarthy, who collected her first gold ball in the 18s, and her first since playing in the 12s division. "I don't know what it is, it's just the X factor." "I don't think we could do much wrong today, to be honest," said Davidson, who is also from North Carolina. "We came out really aggressive and really positive and a lot of things went our way. We stayed really positive and that helped us play really well." Lederman had to settle for a silver ball in the boys doubles, with unseeded Collin Altamirano and Mitch Stewart taking the championship over Lederman and Ryan Smith, the No. 7 seeds, 6-1, 6-4. 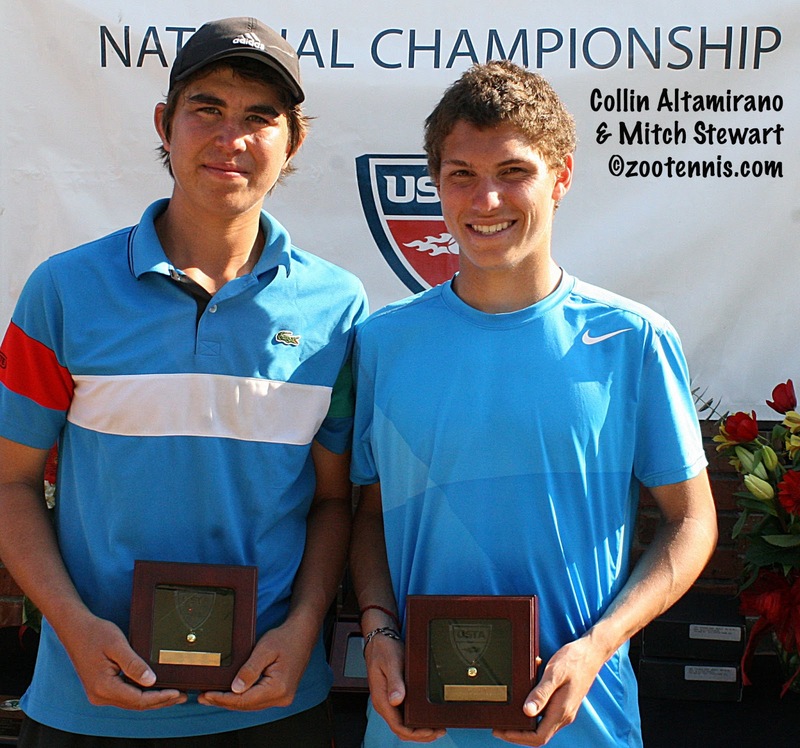 Altamirano and Stewart have also established themselves as formidable team, but weren't seeded due to Altamirano's decision to play more regularly on the Pro Circuit than on the USTA junior circuit. Against Lederman and Smith, Altamirano and Stewart returned well and used their contrasting styles to earn the victory and the USTA gold balls that go with it. "He can hit big and I kind of grind it out," said Stewart, whose other previous gold ball came in singles at last year's 16s Clay Courts. "We match well together and have great chemistry." "He never misses," said Altamirano, a 17-year-old from Yuba City, Calif., who claimed his first gold ball with the win. "I've got a pretty big game, so I can put the ball away, and he just gets every ball in. It's tough to beat us." Stewart pointed to their return game as a key to their win over Lederman and Smith. "We made them earn every point, especially on the return," said Stewart, a 17-year-old from Federal Way, Washington. "We got returns in low and deep and at their feet." In the match for the bronze ball, unseeded Will Adkisson and Ian Dempster defeated unseeded Walker Duncan and Will Showers 6-7(6), 6-2, 6-2. Third place in girls doubles went to Brooke Broda and Spencer Liang, the No. 6 seeds, who beat Allison Miller and Lindsey Hodge, a No. 9 seed, 7-6(5), 6-4. In Saturday's consolation finals, Altamirano will play Aron Hiltzik, a No. 17 seed, for fifth place, and Liang, the No. 6 seed, will face Miller, a 17 seed, to decide fifth place in the girls draw. Before the tournament started, I had an opportunity to sit down with Liang to talk about her commitment to Harvard and her Talbert Sportsmanship award for this Tennis Recruiting Network profile.